This is how my most recent Netflix DVD arrived in the mail. The Chicago Post Office, ladies and gentleman, at your service. No!!! Not Silver City! They'll never replace it. Poor John Sayles. I know! 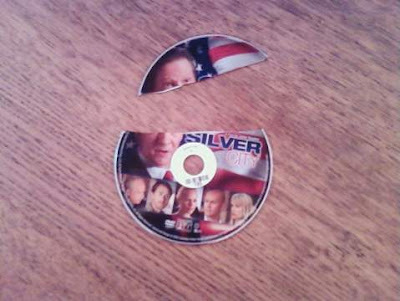 It's a Sayles film I've never seen and I've been saving it SPECIFICALLY for this month in anticipation of the election and I got home on Monday and it was in the mail and I was so ready and excited to sit down and watch it and I open the envelope and.......out drop two pieces of the disc. I'm trying to figure out what it is about this photo, but something about it makes it look like the disc is against a green screen. Do you have an FX studio at your house? Ha! If only, not that I'd have any idea how to use it or even turn it on. Sadly, that is but my coffee table. Though perhaps I can fashion a rudimentary FX studio out of my coffee table?